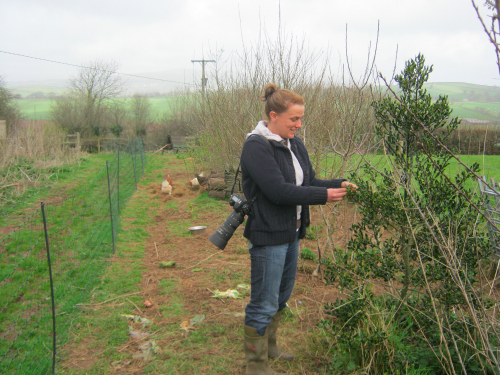 “We question all received wisdom in farming,” said Rebecca Hosking as she and her partner Tim Green showed me round their Devon farm. They only took the land over from her father last autumn, so in many ways it looks much the same as it did before, but they’re very clear about the direction they want it to take and have already started down that path. They practice holistic grazing management, or mob grazing as it’s called. The key is to keep the animals in a tight mob on a small piece of ground for just one day and then move them on. This means that they’re never eating where they’ve recently pooed, always on clean ground. It also means the pasture can be managed much more intensively and constantly increase in quality. When animals have access to a large area they eat the most nutritious plants and leave the others, which means a constant decrease in quality. The small, one-day paddocks are made with electric fences. 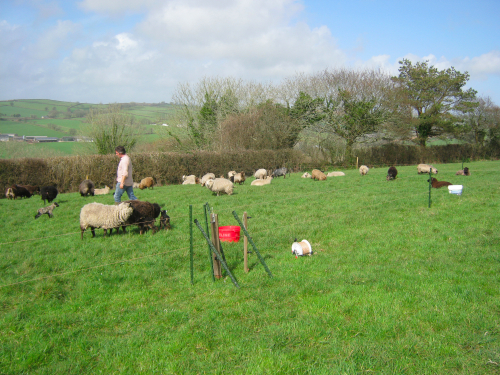 Their first aim is to get the sheep grazing on longer grass, rather than the short sward that they inherited from the previous management system. Longer grass means deeper roots, which means more organic matter added to the soil and more mineral nutrients brought up from the subsoil. It will also mean that the sheep eat some of the grass and trample some into the soil. 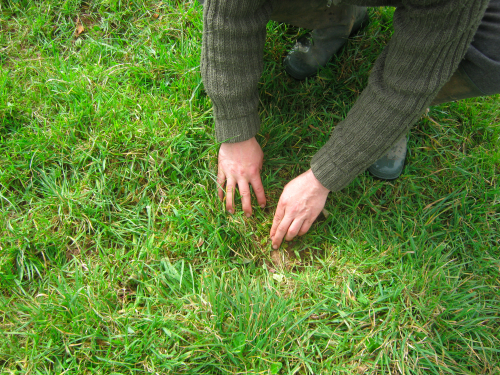 By adjusting the size of the daily paddocks Rebecca and Tim can decide what proportion of the grass feeds the sheep and what proportion feeds the soil. Little patches of bare soil like this will soon be a thing of the past. Trampling in grass in anathema to conventional farmers, but it’s a key element in the holistic system. It’s a natural, home-grown source of soil fertility and it also helps to form a mat of organic material at the soil surface. This will keep the sheep’s feet off the soil, preventing lameness and enabling them to be kept outside all year round without damage to the soil. “We’re breeding for health,” Rebecca replied. 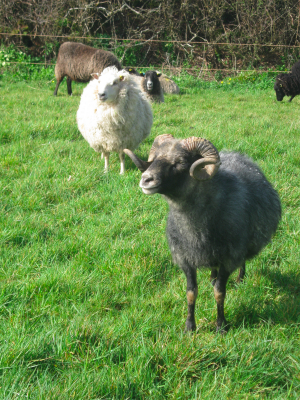 Shetland are a naturally short-tailed breed, originating from the wild sheep of northern Europe, rather than from the Middle East, which the more commercial breeds do. The ram is Icelandic, another short-tailed breed. Tim and Rebecca don’t worm the sheep, vaccinate them or treat lameness – they leave it to the natural immune system. Nor do they assist lambing – they don’t need to. 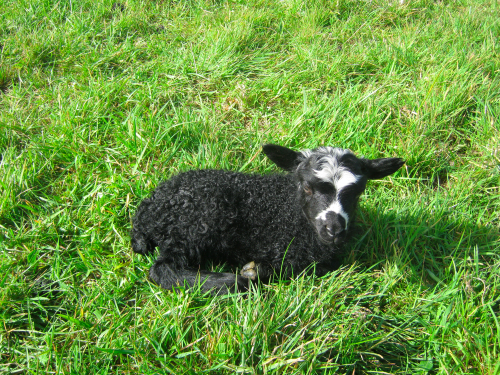 Several lambs were born while I was there and they all popped out quite easily. The electric fences mean that it’s easy to plant trees in the middle of the fields. Wherever the sheep are the trees can always be on the other side of a fence. They’ve already planted a network of fruit and other trees this way in some of the fields. They’re also looking at fodder trees to help feed the animals. They make no hay or silage. The only feed they bring in is just enough sheep nuts to train the ewes to follow a bucket. This makes it easy to move them, even down a public road with lots of junctions, which otherwise would need several people to block off the alternative routes. Holly is a highly nutritious tree. This variety is almost thorn-free and has great potential as fodder. This year they plan to introduce goats and pigs. Apparently the Large Black breed can thrive on a diet of herbage alone, though it does mean they grow much more slowly. They’re also thinking about turkeys, and they plan for cattle the year after next. They will also increase the diversity of the fields by sowing extra grasses, clovers and herbs. The trick is to sow them in the paddock where the animals will be the next day, then they get trodden in.